In the aftermath of a massive economic recession, the authoritarian government has passed the BR Act as a means of population control. Japanese middle school student Shuya Nanahara copes with life after his father's suicide. Meanwhile, schoolmate Noriko Nakagawa is the only student regularly attending class 3-B. Their teacher, Kitano, resigns after being wounded by another student. One year later, class 3-B takes a field trip, but they are gassed, fitted with electronic collars, and sent to a "briefing room" in a school building on a remote island. 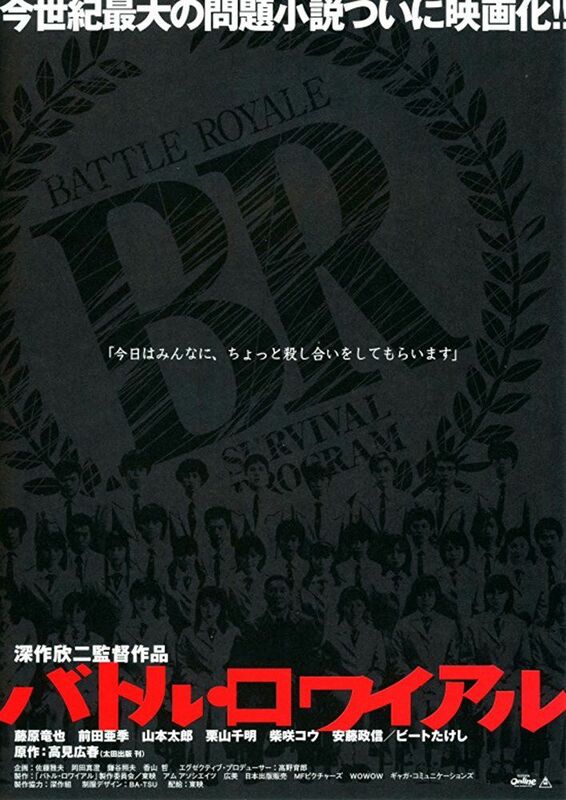 Surrounded by JSDF soldiers, Kitano explains that the class has been chosen to participate in the annual Battle Royale as a result of the BR Act. A cheerful orientation video instructs the class: they have three days to kill each other until only one remains. The explosive collars will kill any uncooperative students or those within daily "danger zones". Kitano kills two students, Fumiyo Fujiyoshi and Yoshitoki Kuninobu (Shuya's best friend and Kitano's attacker), for horseplay. Each student is provided rations, water, a map of the island, compass, and a weapon ranging in efficiency from firearms to a paper fan. Read more on Wikipedia.